We offer Rentals for fishing, crabbing or sightseeing cruises on Roanoke Sound. The boats can be rented half-day or full-day. Our Customers can choose from 17' Outboards and 23' and 26' Pontoon Boats - all maximum capacity 10 persons. Call 252-441-5028 for rental rates, reservations or more information. Rental fishing and crabbing gear is available for your enjoyment. Fishing Unlimited's 600 foot Outer Banks Fishing Pier is well known for it's great fishing and family atmosphere. Located in South Nags Head, it is the fishing pier nearest to Oregon Inlet. The pier is lighted and is open 24 hours a day. The historic pier has been serving fishermen for over 50 years! In the pier house you will find a fully stocked tackle shop with all your fishing needs, an oceanfront grill open for breakfast, lunch and dinner, with Live Music Nightly, video games for the kids as well as rental rods and reels. Daily, weekly and weekend passes are available. And, we DO offer Senior Citizens' Discounts. 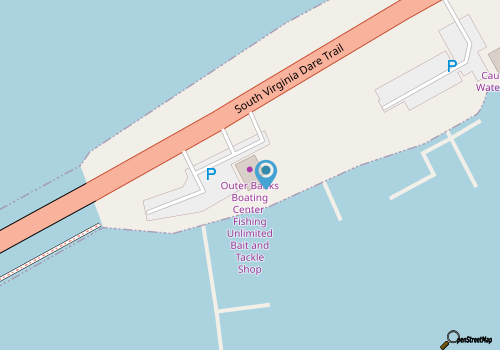 Outer Banks Fishing Pier is located at milepost 18.5 in South Nags Head. Call 252-441-5028 for current hours.